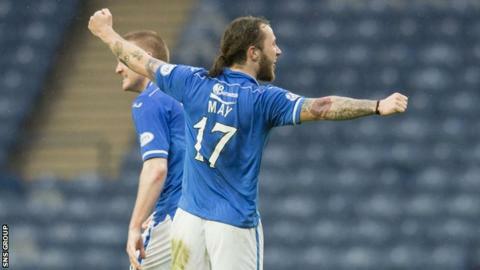 St Johnstone have opened talks on prolonging Scottish Cup hero Stevie May's contract at McDiarmid Park. The striker's double in Sunday's semi-final win over Aberdeen takes his goal tally for the season to 25. And manager Tommy Wright told BBC Scotland: "We are in early discussions about the possibility of trying to extending his contract. "It's wait and see. We're waiting for word back from his agent. I'm just happy to have him and we'll deal with whatever comes in the summer." Rotherham, Peterborough and Preston all made enquiries about May this season and Wright expects more interest to follow. The striker, who made a scoring debut for Saints as a 16-year-old in 2009, enjoyed two prolific terms away from the club, scoring 19 goals with Alloa and then 26 goals on loan at Hamilton. "When I took over there was a possibility that he was going to be loaned out again," revealed Wright. "But it was important that he knew what I thought of him. "It was quite simple. I said 'you'll get an opportunity and it will be up to you'. "He said 'you give me an opportunity and I'll take it', and he's done that. He's been outstanding. "He listens to people, he wants to improve and his all-round game has got better as the season's gone on. "I'm delighted he extended his contract but I didn't think he would leave in January. He's a Perth boy and he felt he wanted to achieve something at this club. "It's inevitable that it (a transfer) will happen some time. Just when will depend on what clubs come in for Stevie and if they meet our valuation. "We know when those circumstances are right that he will move on. "He's a goal-scorer and he's got the potential to go to the very top." May's brace of goals at Ibrox sealed a first ever Scottish Cup final for St Johnstone, capping what has been a remarkable debut season in charge for Wright, who was previously assistant to Steve Lomas. Saints played in Europe, knocking out Rosenborg of Norway, reached the last four in the League Cup and secured a top six finish in the Premiership. "I've enjoyed it but I've been well supported by the chairman and my staff," said Wright. "The players have responded well to what we are trying to do. I was fortunate to be walking into a dressing room with a group I really trusted - in terms of how they are on the pitch and off it. "They've made it easy for me."